A JOINT team from the Department of National Defense and the Armed Forces will be in Italy this week to scout for assets that will strengthen the defense capability of the military. Defense Secretary Voltaire Gazmin said the team will look for aircraft, vessels and even armored vehicles that could be acquired by the military for both of its external defense and internal security operations. Over the weekend, Gazmin said the department will be acquiring weapons and assets for the Armed Forces amounting to P70 billion. The budget for the acquisition will be spread up to 2020 or even beyond the term of the current administration. Since the massive procurement could not be financed by the government in just one release, the defense chief said the acquisition will be done through a Multi-Year Obligation Agreement (MYOA) from Congress. 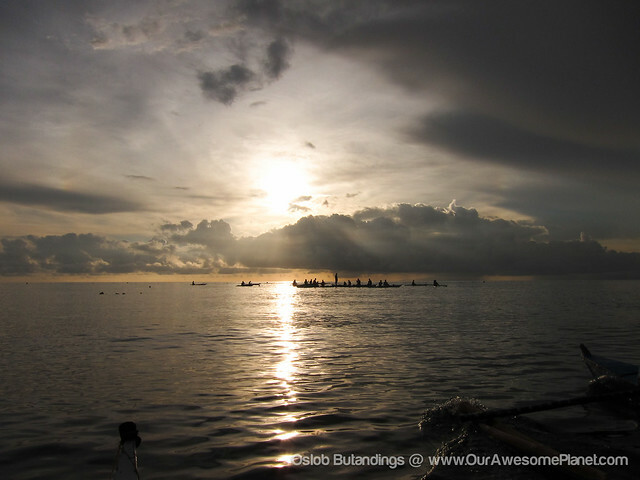 Adoption of the MYOA was first proposed during the term of Defense Secretary Gilberto Teodoro as a scheme in financing the military’s capability upgrade program, and which was implemented during the term of Defense Secretary Norberto Gonzales in 2010. In fact, a contract for the delivery of a multirole vessel from South Korea was sealed by Gonzales under the same scheme. Payment of installments for the warship began last year. Gazmin said that aside from the US, which is the country’s principal sources of assets and equipment for the military’s capability upgrade, the defense department is also looking at Italy, Spain, France, United Kingdom and South Korea as possible sources of assets. From Italy, the defense chief said the same team will also visit Spain for the same purpose, and both trips will be taking this week. “We will see the best we can get for the funds available, that will be the first priority,” Gazmin said. He said the assessment, inspection and possibly even acquisitions should be done at least by July this year. “It should be finished by July, or worse case scenario, by November. But by July, we should have attained at least 50 percent, that is already a good batting average,” Gazmin said. He said the government is looking to acquire armored vehicles; aircraft, including long range patrol aircraft and fighter jets that include the F-16 from the US; multirole vessels; missile-armed ships; anti-submarine vessels and radars. Gazmin said the interdiction capability of the military will be useless if it will not have enforcement weapons such as fighter jets and ships with guided missiles. The big ticket procurements were necessary to defend the country’s territory and discourage intrusions into its maritime domain, particularly by China. Gazmin said the modern weapons and assets are also necessary in so that the country is able to put up a credible force and protect its territory in the disputed Spratlys. Meanwhile, two US Navy ships are in the country for routine port calls. The guided-missile destroyer USS Wayne E. Meyer (DDG-108) docked at the Manila Bay while the USS Chafee (DDG-90) dropped anchor in Cebu. “USS Wayne E. Meyer and USS Chafee are here to engage with their counterparts in the Armed Forces of the Philippines and perform Community Relations Projects, as well as allowing the crew an opportunity for rest and relaxation,” the US Embassy in Manila said in a statement. “These goodwill visits highlight the strong historic, community, and military connections between the United States and the Republic of the Philippines,” the statement added. At the same time, at least three retired military officials have been hired by the various agencies of the Department of National Defense as consultants, primarily to help in the procurement of assets and equipment for the military. Peter Paul Galvez, DND spokesman said, the three retired officers, were hired to help the department in its defense acquisition system for the Armed Forces. They are retired Lt. Gen. Willie Florendo from the Air Force, Vice Adm. Luisito Fernandez from the Navy and Gen. Victor Ibrado, former Armed Forces chief of staff. “Their functions are to give advise on the perspective of the modernization. At least, they have the experience although they are already outside the Armed Forces,” Galvez said. 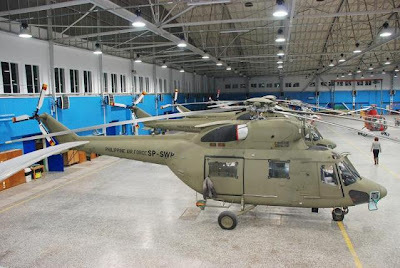 MANILA, (PNA) – The Philippine Air Force (PAF) will get the first delivery by the middle of next month of four of eight brand-new combat utility helicopters it ordered from PZL Swidnik of Poland. 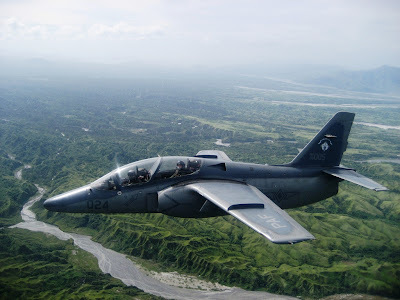 Lt. Col. Mike Okol, PAF spokesman, told the Philippines News Agency that the remaining four helicopters will be delivered in November, also this year. PZL Swidnik is the biggest helicopter manufacturer in Poland. Its main products are the PZL W-3 Sokol and PZL WS-4 helicopters used by the Polish Air Force and other European countries. The PAF bought the eight Polish-made helicopters at a contract price of P3 billion. The arrival of four utility combat helicopters is part of the Armed Forces of the Philippines’ modernization program to boost the PAF’s air power, particularly supporting ground troops during combat operations. The PAF has in its arsenal the reliable UH-1H “Huey” helicopters and the MD-520-MG gunships from the United States. The Polish company won the bidding to supply the PAF eight brand-new combat utility choppers. The funds for the purchase of the choppers were part of the AFP modernization budget in 2007. Okol said the acquisition of these helicopters is timely because the Air Force badly needs helicopters of this type to support government ground forces during combat operations. The Swidnik helicopter can carry 14 persons, including the pilot and co-pilot and has a maximum speed of 260 kilometers per hour and a range of 745 kilometers non-stop. The Polish-made choppers can be armed with a variety of weapons, air-to-ground rockets, air-to-air missiles, M-60 machine guns and 20-mm cannons. The government is looking to roll out P70 billion-worth of projects over the next eight years for both the military and defense department, Defense Secretary Voltaire Gazmin revealed on Friday. Included in these projects are planned acquisitions of military equipment such as fighter jets, long-range patrol aircraft and multi-role vessels. Gazmin, speaking to reporters after the launch of the Defense Acquisitions System Assessment at Camp Aguinaldo, said also included are "big ticket" items such as radars and other major improvements in the military. The acquisitions will be carried out until the year 2020. Gazmin also said the programs that will benefit from the spending will impact on both internal security matters and territorial defense needs of the country. Gazmin said they will deploy teams to various countries starting Saturday to scout for possible equipment. "Take ships: From Europe, from the US, from Asia - We'll take a look and evaluate which is best and affordable for us, and we'll prioritize that, not necessarily those made in America," he said in Filipino. 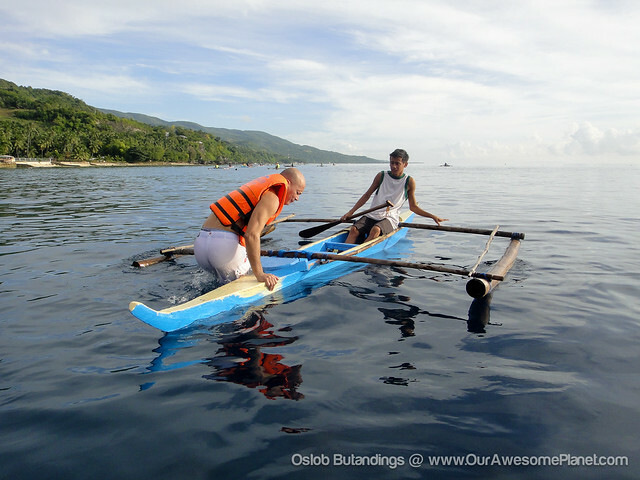 Butanding Watching, Is it Really More FUN in Oslob? 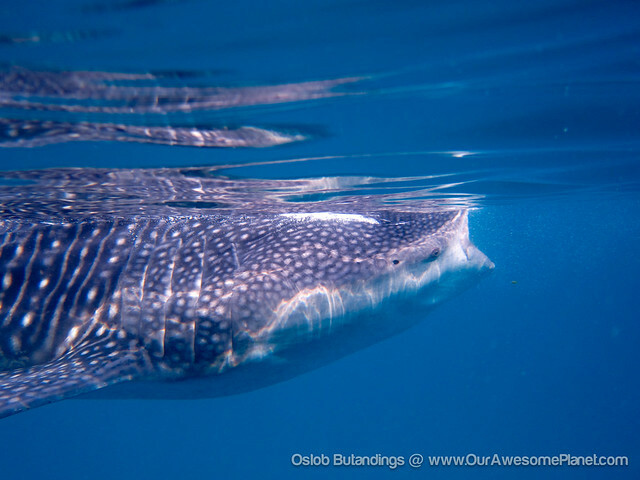 I can't believe we actually had a super close encounter with whale sharks (locally known as butanding) in Oslob in the South Eastern Coast of Cebu (3 hours away from the city)! Our experience here's better than in Donsol. 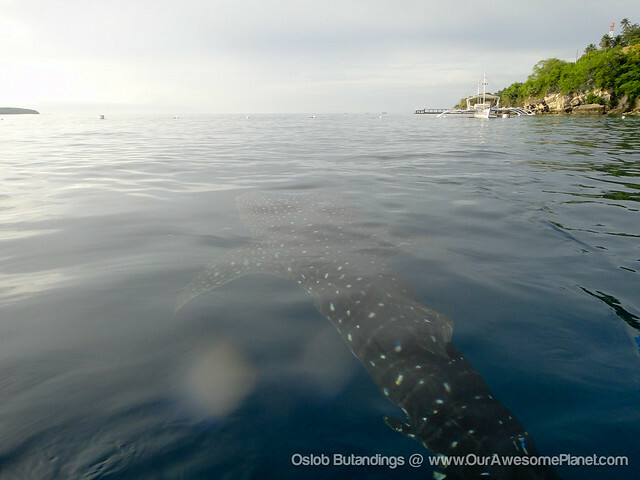 In Oslob, the whale sharks congregate in one area near the beach where the fishermen feed them krill (small saltwater shrimps) every morning. Also, they seem to act like pets of the fishermen and are now getting used to the presence of humans watching them everyday. Unlike Donsol, there's a higher chance you'll see the giant creatures up close without the need to chase them. 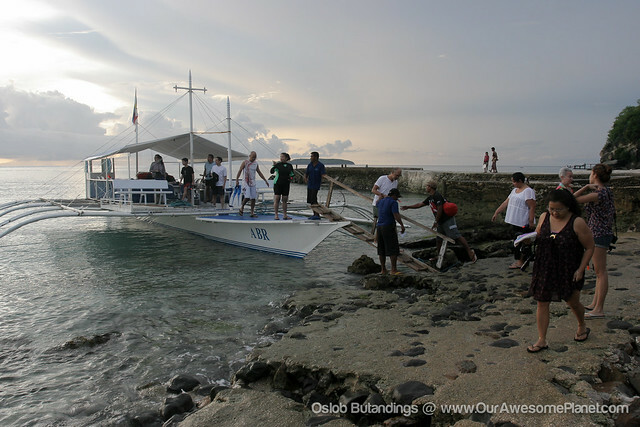 Is Whale Watching in Oslob really more fun for the fishermen, the tourists, the whale sharks and Mother Earth? It is advised to start early at 6 a.m. to beat the rush of tourist crowds. 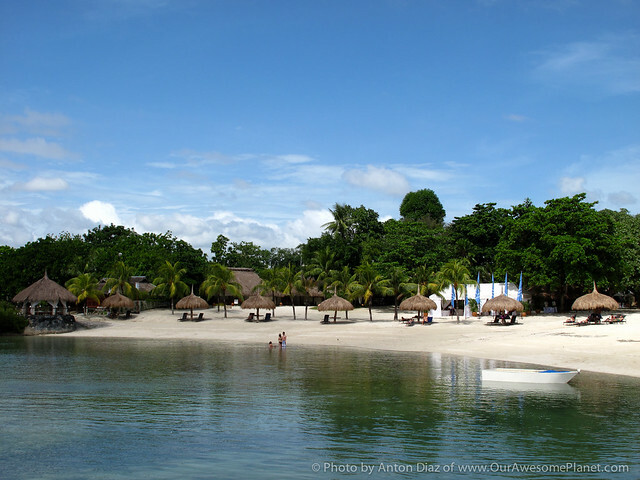 The best place to stay is Bluewater Sumilon, which is located on an island 30 minutes off the coast of Oslob, Cebu. We woke up really early, just had coffee and went straight out for Whale Shark Watching. 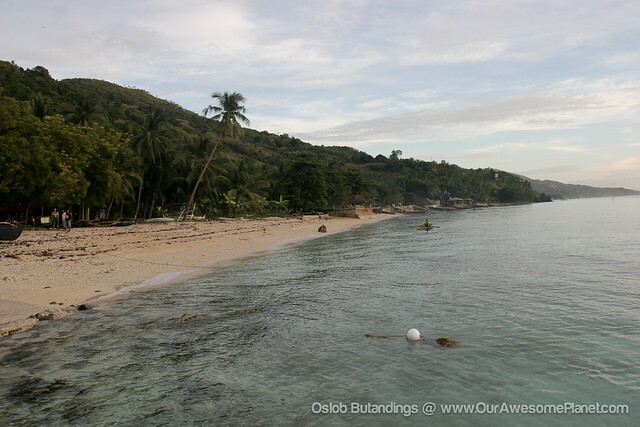 The beaches of Oslob were relatively unheard of in the past years, but this summer 2012, it will be the hottest destination to watch the majestic whale sharks. 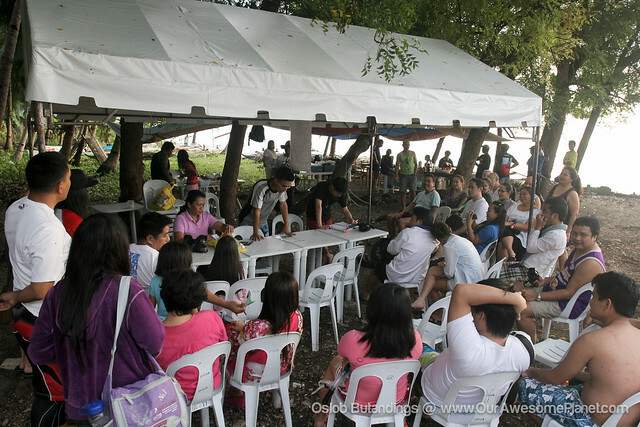 The local municipality of Oslob started to organize the Whale Watching tours with makeshift tents selling breakfast and souvenir items. 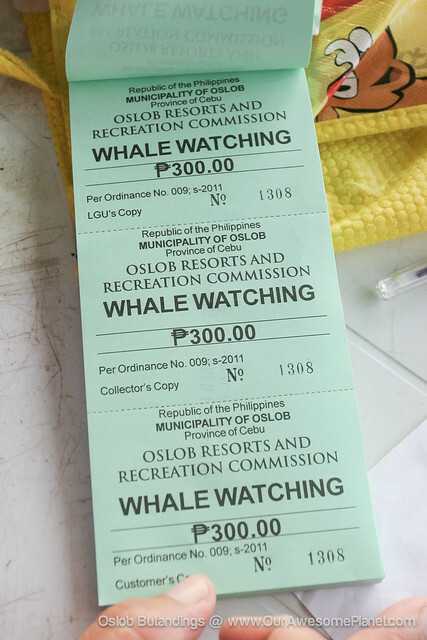 You have to register in the log book and pay P300 per head as per the Oslob Ordinance. 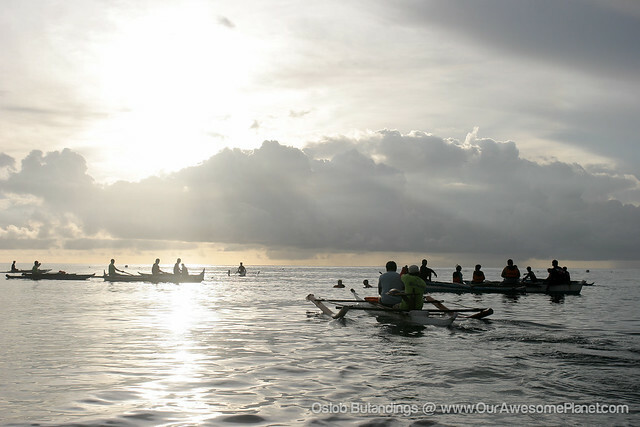 When the whale watching initially started, the fishermen directly benefited from it. 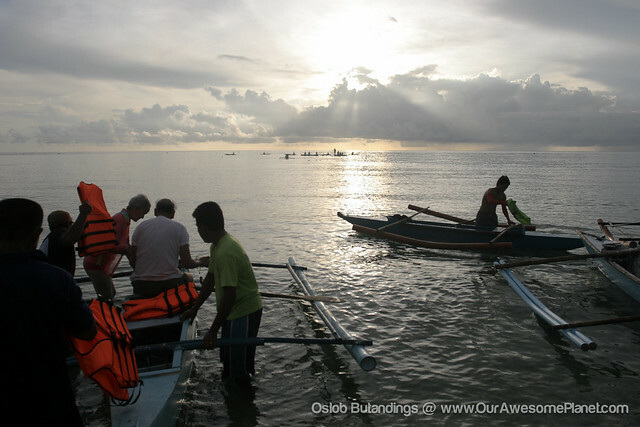 But now, the Oslob Municipality wants to profit from it and just pay the fishermen a boat rental fee. That's not fair. The fishermen should be given credit and appropriate profit-sharing for developing this latest tourist attraction. The Cebu Provincial Government wants to enter the picture as well. But why? 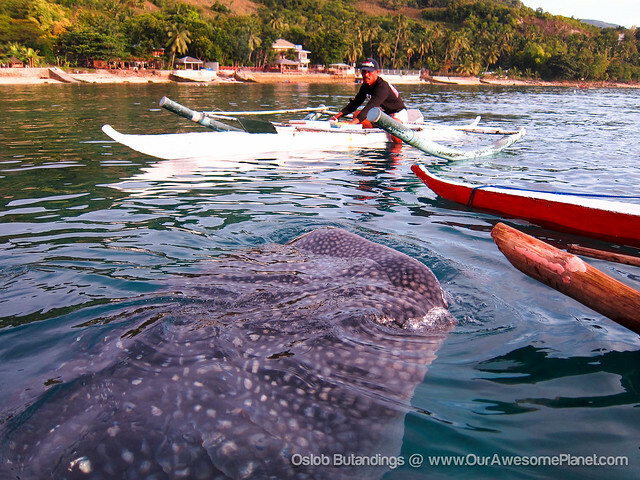 The Oslob Municipality requires all tourists to undergo an orientation on the Whale Shark's 10 Commandments. Honestly, it's one of the lousiest orientations I've ever attended. The orienter just basically read aloud the printout of the 10 Commandments. So, where does the P300 per head go? 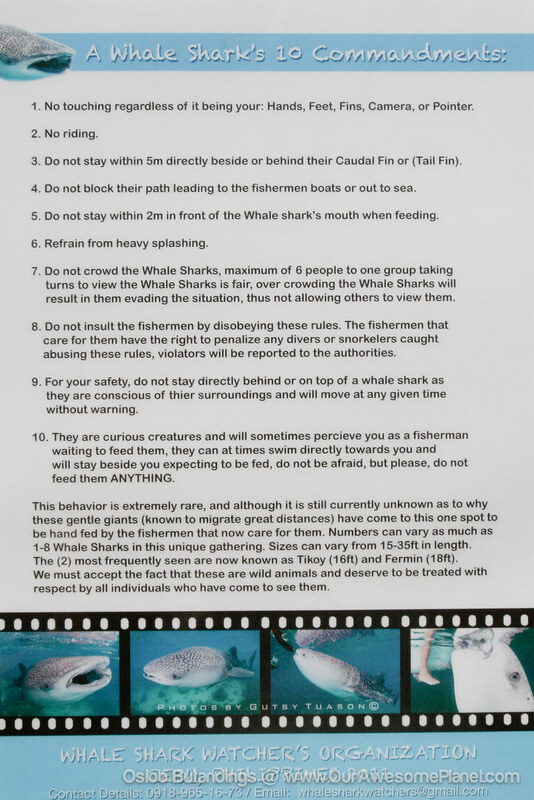 It is easy to forget these rules when the sharks are up close and look quite gentle. Remember not to touch them and stay away from the tail fin! 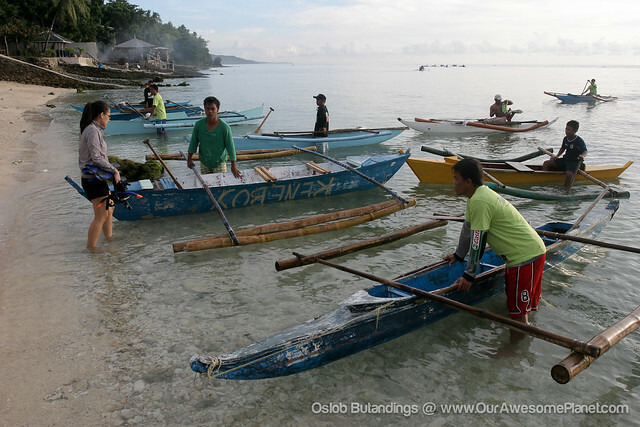 The fishermen use dugout canoes that they paddle manually to the sighting area. Each boat can handle 1-2 persons. 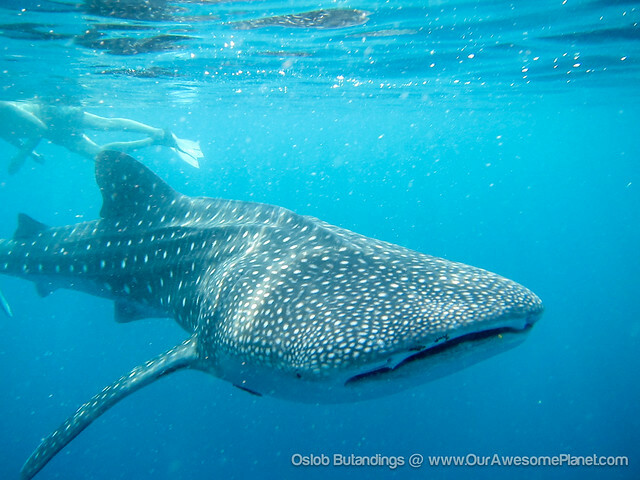 You only have a 30-minute window to see the whale sharks to give everyone a chance to view them (with a ratio of 1 whale shark to 6 tourists). 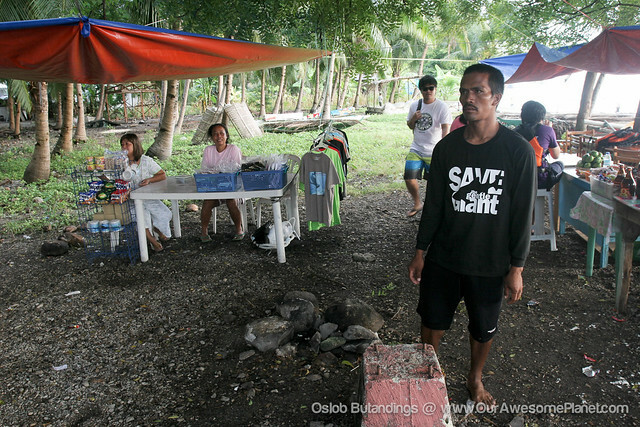 In Donsol, they don't have a time limit but they are very strict about the whale shark-to-tourist ratio. 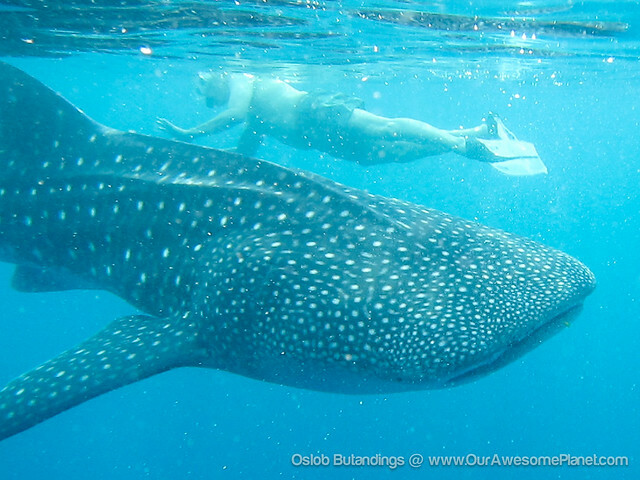 It was a surreal experience for us -- imagine encountering these whale sharks up close! The only other place in the world that you can have the same type of encounter is in Papua. 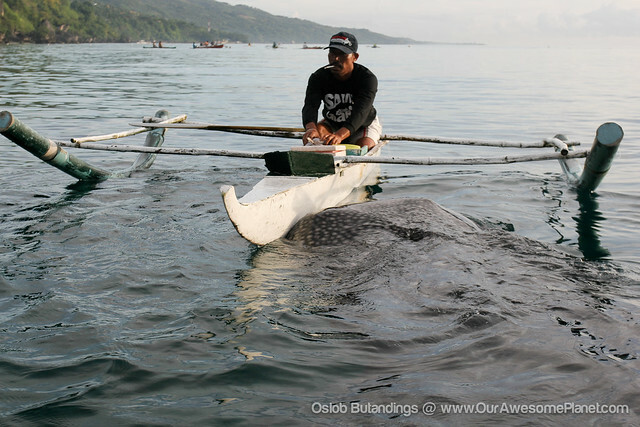 Only manually paddled boats are allowed since motorized boats could hurt these gentle giants. 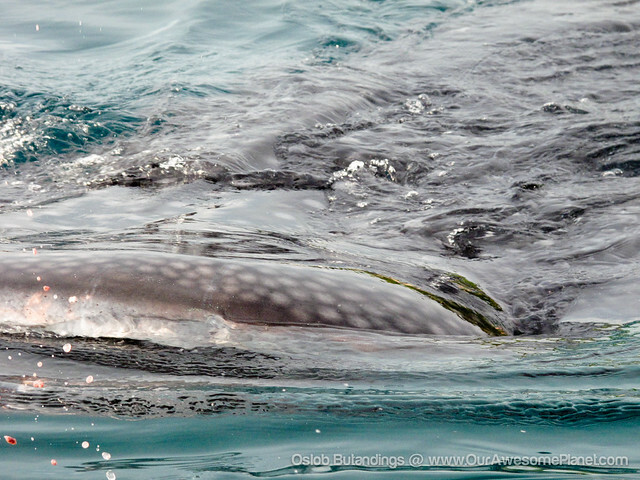 The butandings would often follow the fishermen who give them krill during their feeding time of 6am to 1pm daily. Some environmental conservationists argue that humans should not tamper with wildlife by feeding them, creating a co-dependent relationship with the animal. 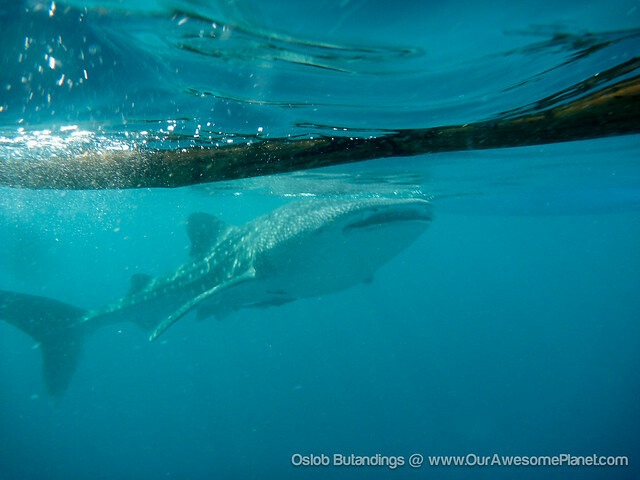 The whale sharks tend to bump into the boats as they go up to eat their krill breakfast. Only the fishermen are allowed to feed them. 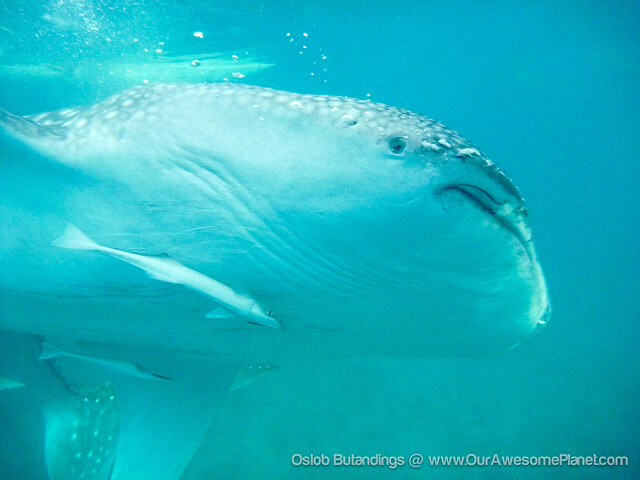 But even if you can't feed them, you get the chance to view the whale sharks like never before. 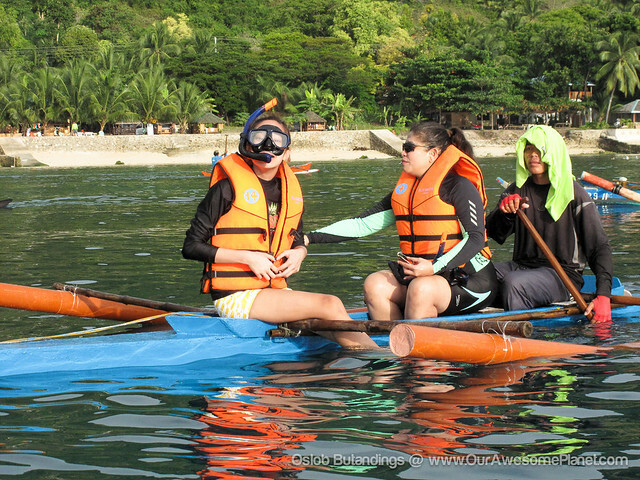 Don't forget to bring your snorkeling gear, fins, and underwater camera to capture unforgettable moments. 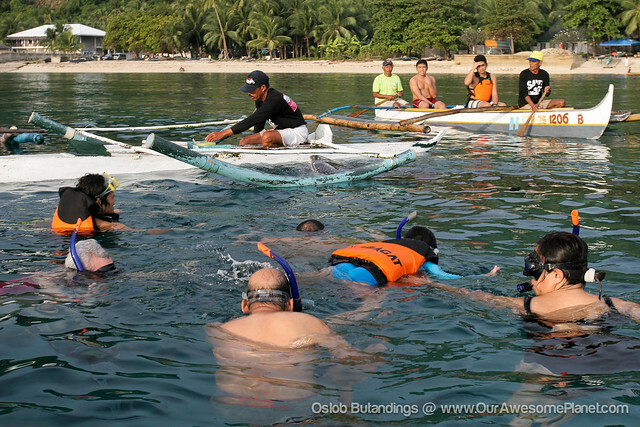 Majority of the tourists can't help but jump into the water, driven by their excitement to see the whale sharks up close. 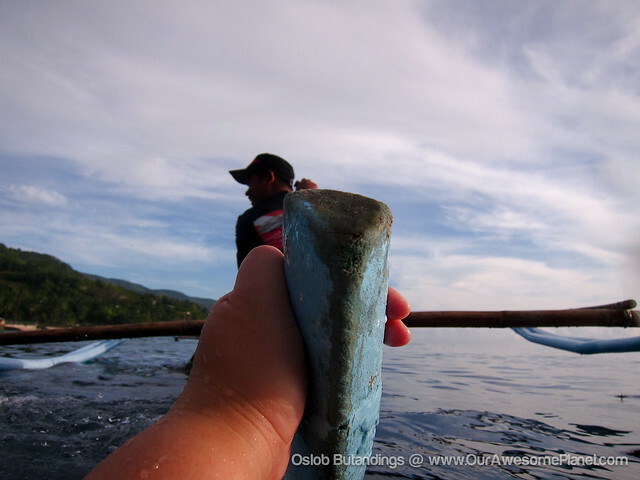 I guess keeping the 1 whale shark : 6 tourists ratio can be very challenging for the fishermen. The total number of boats and tourists should be controlled at any given time. Again, remember not to touch them and stay away from the whiplash of the tail fin! Butandings look scary and cute at the same time underwater. Please respect these wild creatures. Otherwise, you can just hang on to the tail end of the banca. 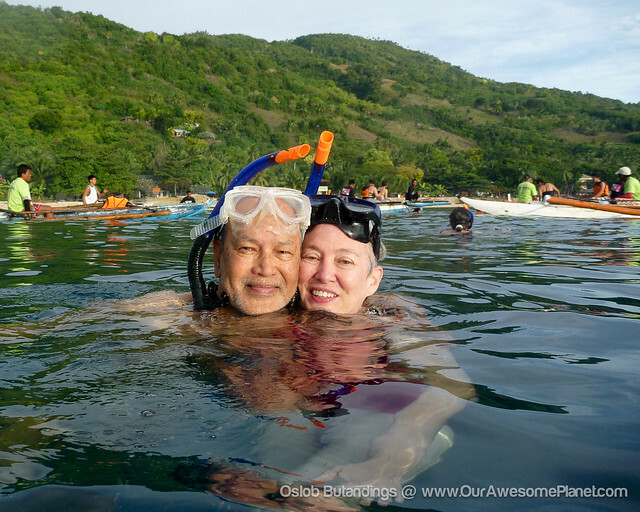 It is best experienced with your loved one, your family or barkada. 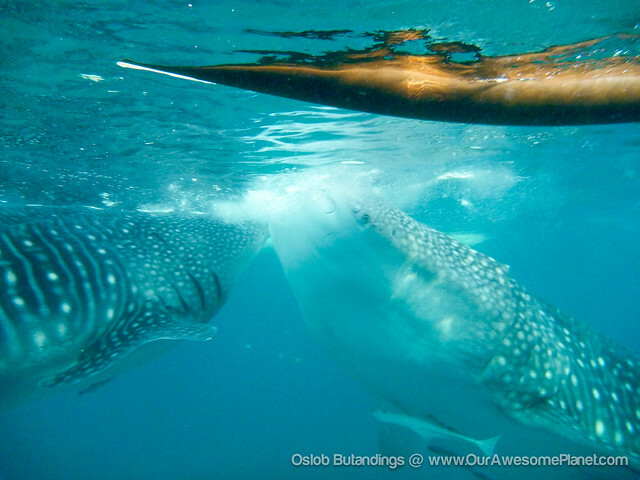 The Oslob Whale Shark Encounter is controversial because of its potential dangers and effects on the animals. Do we allow the fishermen to continually feed the whale sharks and make them dependent on these feeding sessions so that tourists can watch them each day? We certainly need experts (WWF and marine biologists, among others) to intervene and analyze the sustainability and impact of this Fisherman-Whale Shark friendship. 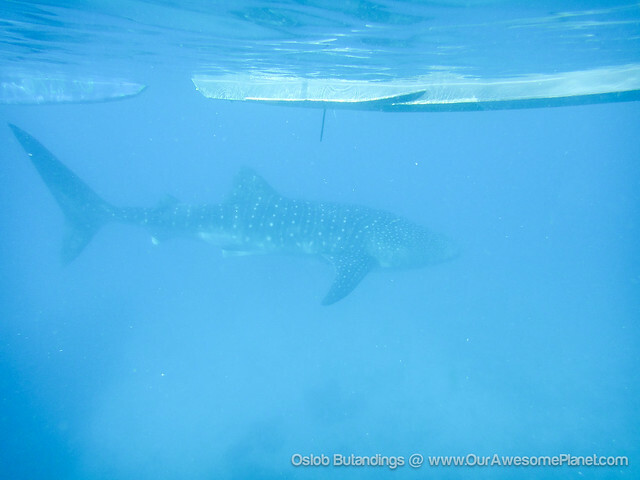 I must admit, though, that we had a lot of fun in our close encounter with the whale sharks. 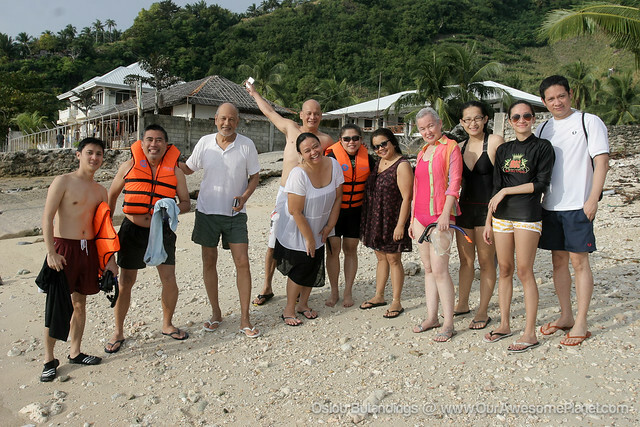 We were like kids again, jumping up and down, raving about the wondrous butanding experience. 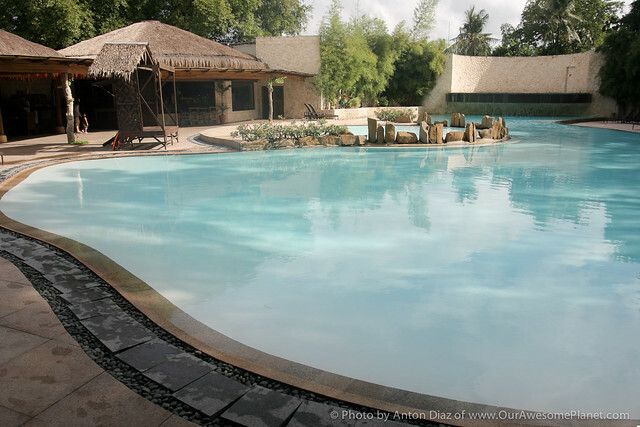 During our Sinulog Experience in Cebu, we stayed at the Bluewater Resort in Maribago. 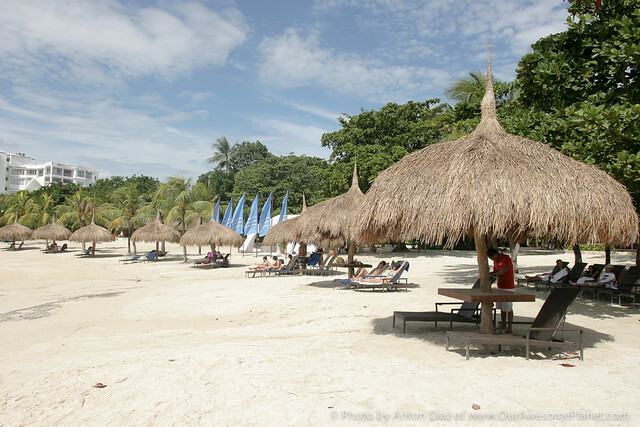 We enjoyed the food, the Benji-designed rooms, and the island beach resort feel away from the city. 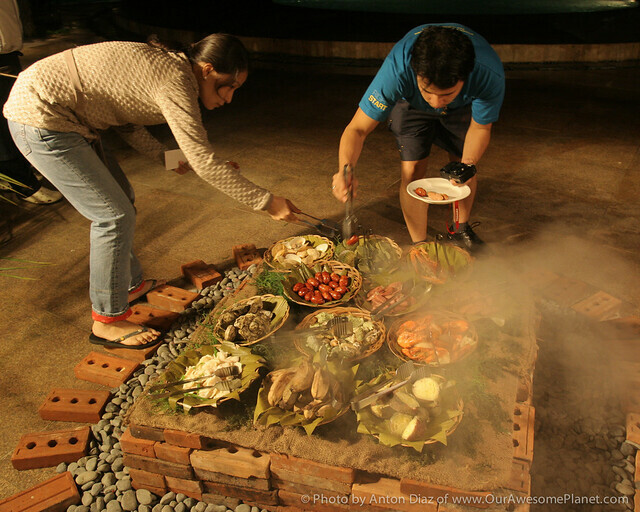 Bluewater Clambake Dinner Buffet (P1,250 nett/person from 6pm to 10pm). 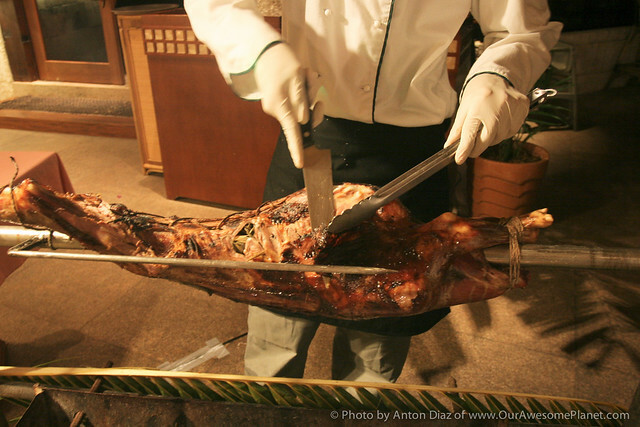 Each night, Bluewater hosts a special themed dinner buffet with a dance show. 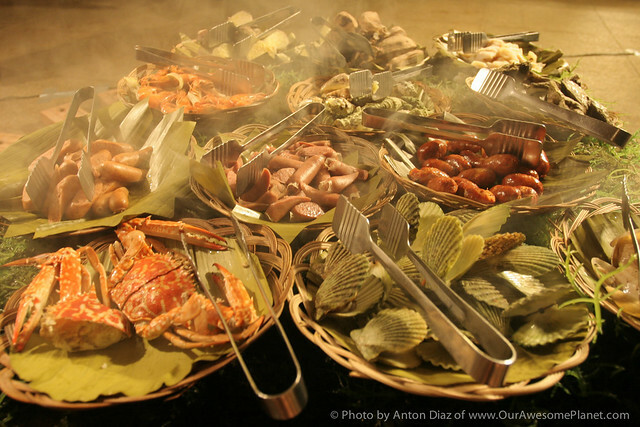 I'm not really fond of buffets but Bluewater's signature Clambake Buffet is one of the best Filipino buffets I've ever tasted. This is usually held at the beachfront, but when it rains, they move it to the Allegro Poolside. 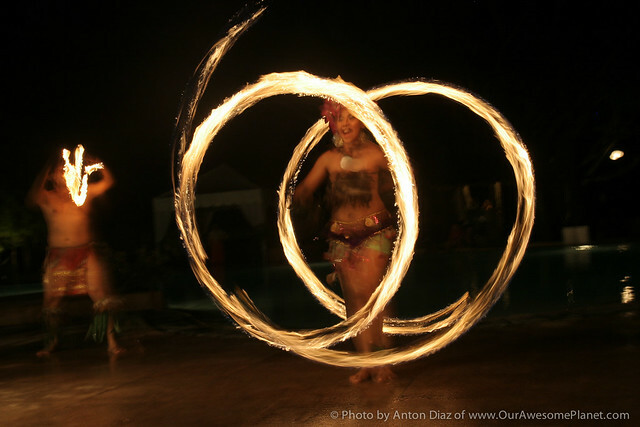 The buffet is accompanied by a Fireball Dance Show, which starts at 7.30pm. 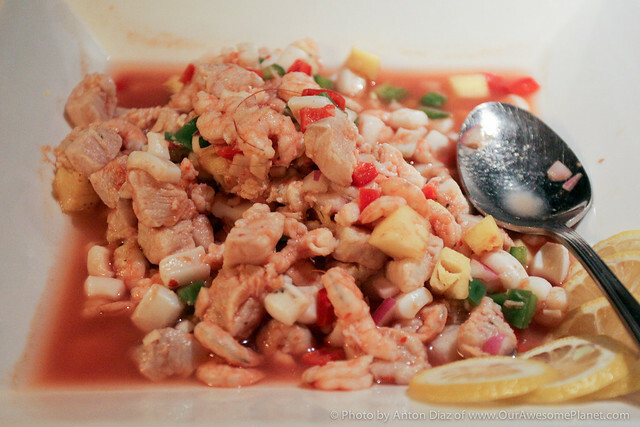 We started with a serving of fresh Seafood Ceviche with lime and a little chili. 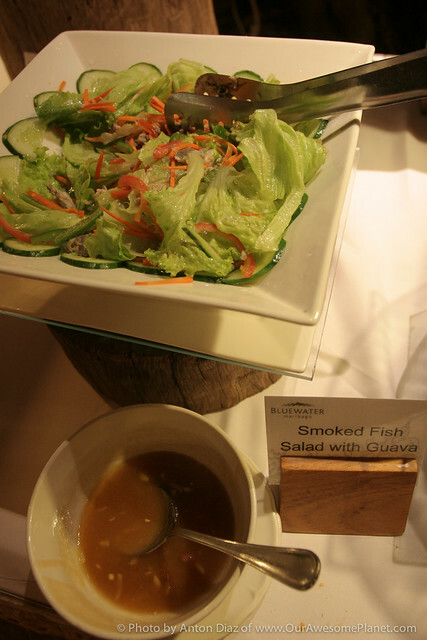 We loved this Smoked Fish Salad with their signature Guava dressing. 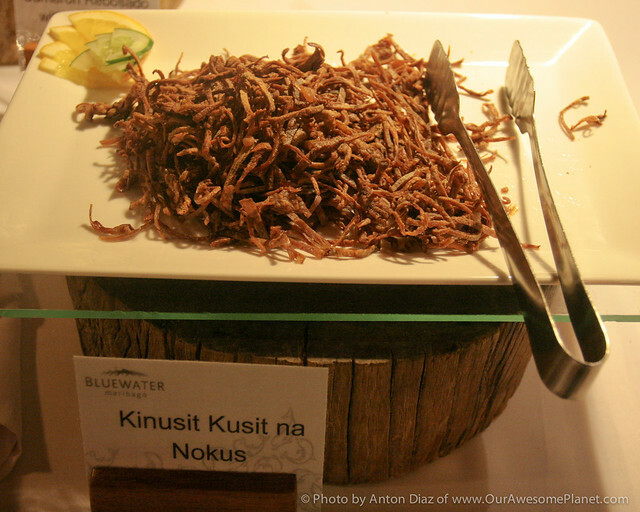 Most of us raved about these crispy slices of pusit. It's best eaten hot off the pan with garlic rice and sukang pinakurat. 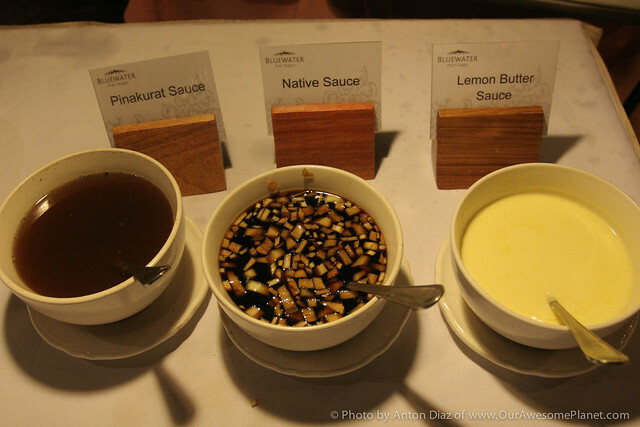 ...and then paired with the spicy pinakurat mixed with the native soy sauce with garlic and onions. 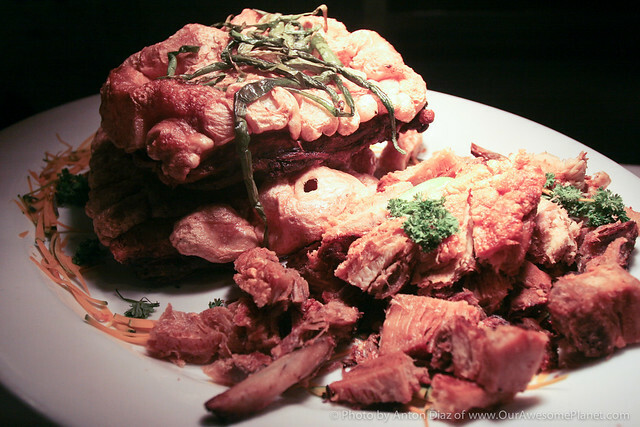 The Crispy Pork Belly was too yummy to resist. 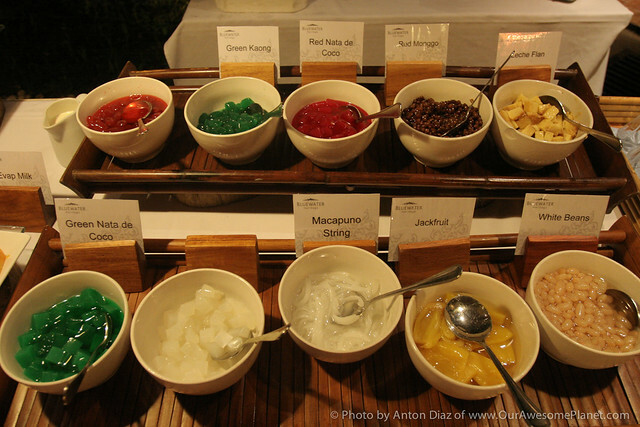 For dessert, we ended with a refreshing glass of halo-halo with homemade ice cream and fresh fruits. 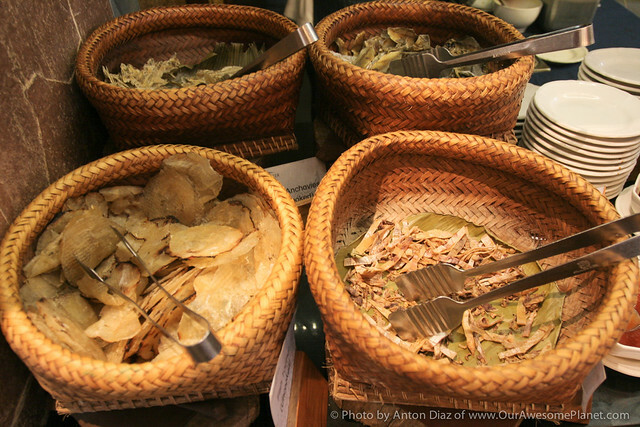 The Cove is Maribago Bluewater's beachfront restaurant that serves fresh seafood sourced from the best islands in the Visayas. 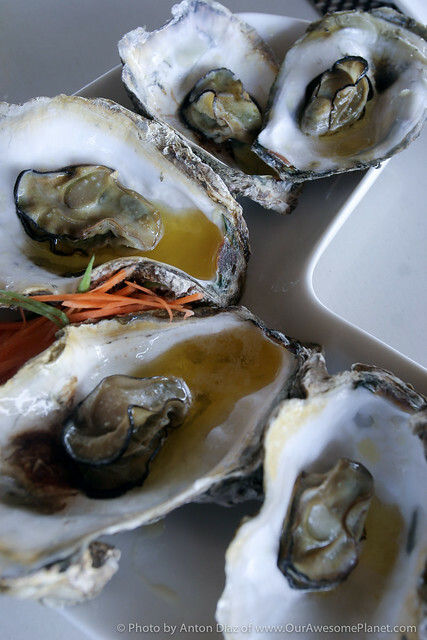 Oysters (P240 for 6 pieces). Baked with Lemon Butter. Rache loves oysters! Nothing beats getting it fresh and cooking it with a little butter. 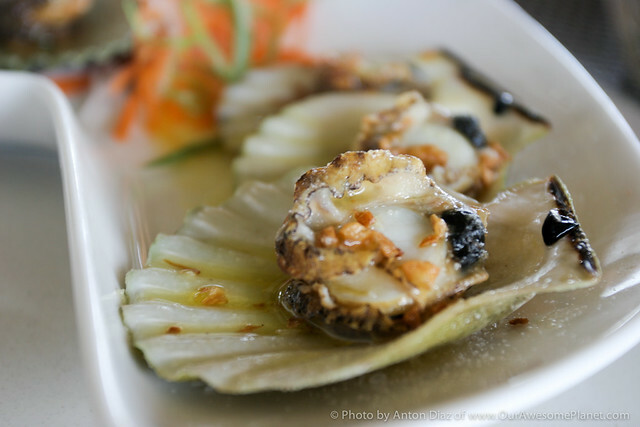 Scallops (P220 for 6 piecs). 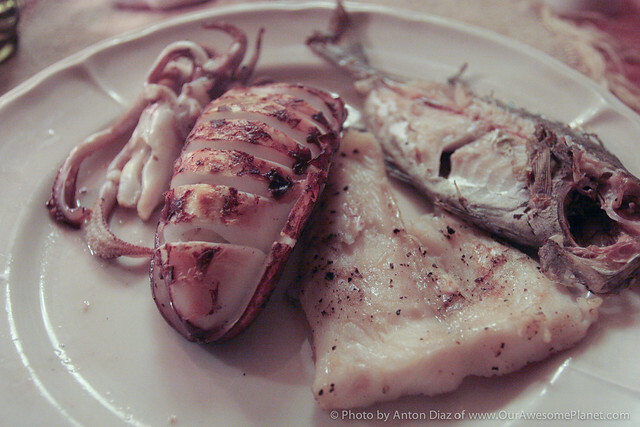 Baked with Garlic Butter Sauce. 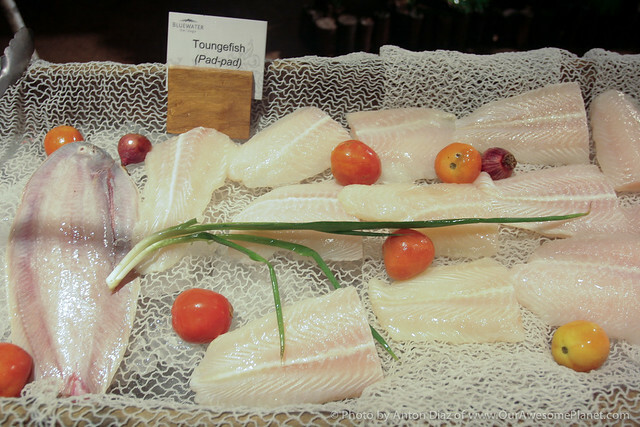 Pugapo (Grouper) (P210 per 100grams). 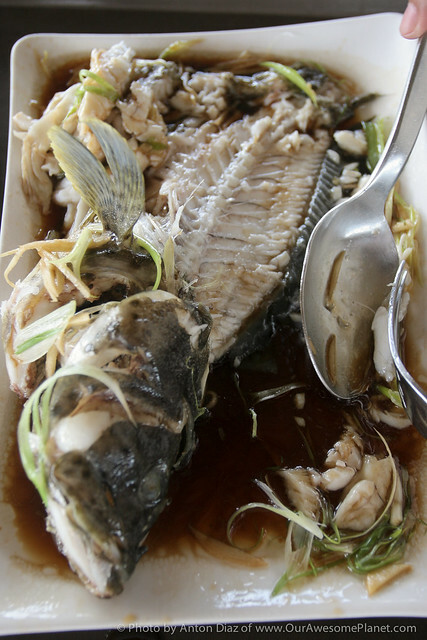 Steamed and served with Ginger and Sesame-Soya Sauce. 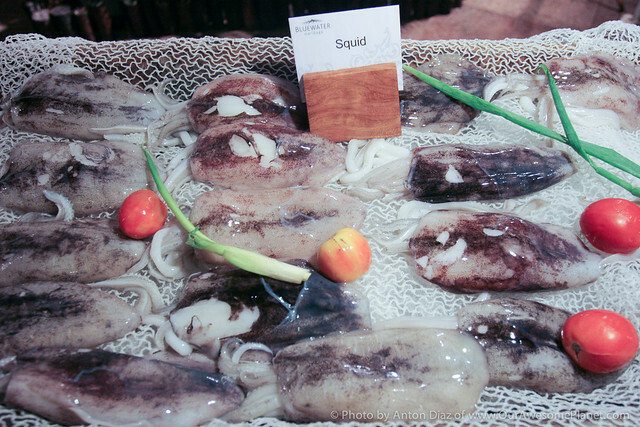 This fish is popularly known as Lapu Lapu, but here in Cebu, they prefer to call it Pugapo. 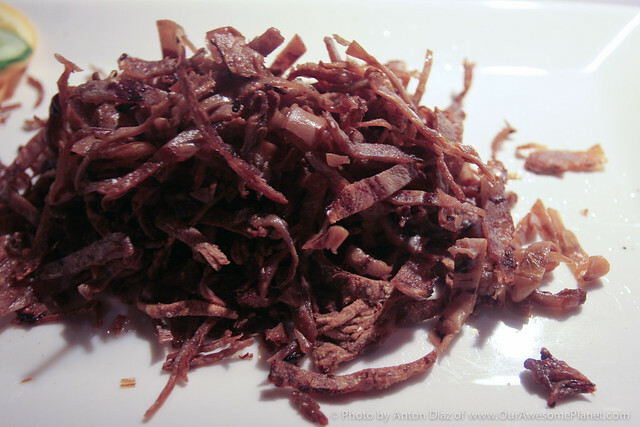 It's very fresh and meaty! 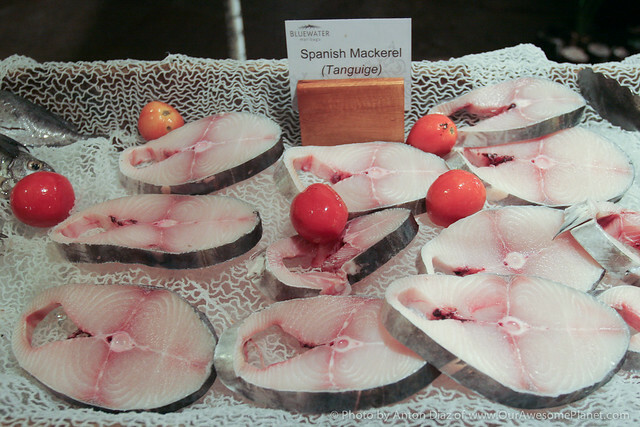 The seafood is cooked live from their Fresh Seawater Aquariums! 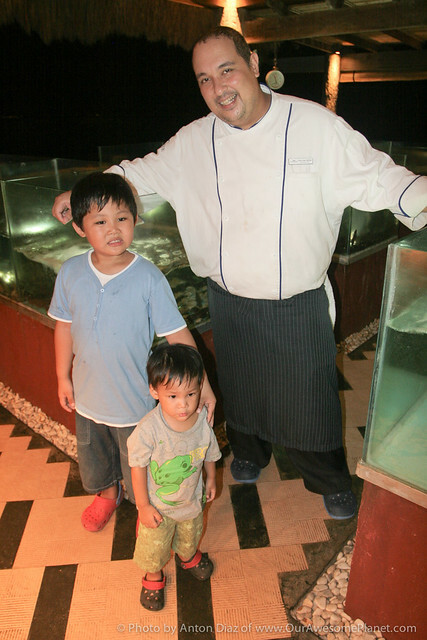 The man behind The Cove's yummy seafood dishes is Bluewater's Executive Chef Allan (formerly of Masas Filipino restaurant). 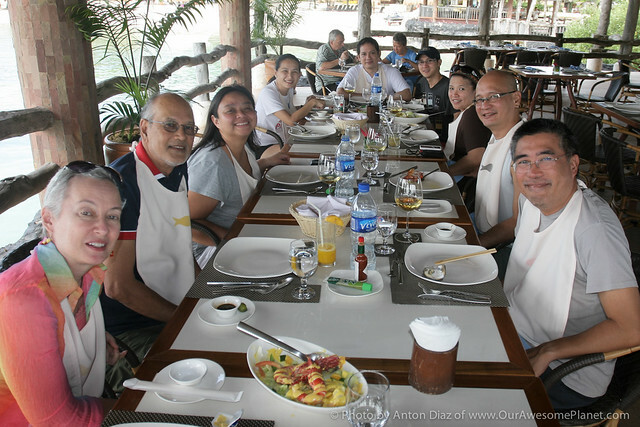 Every morning, we feasted on a Cebuano breakfast of Danggit, Crispy Squid, and Fish Tocino with garlic rice and white omelet. There are three wings in the resort: the Garden wing (with its own pool), the new Amuma Spa wing (with its own pool) and the Beach wing (near the main swimming pool and the beach). The pools are newly renovated and shallow -- designed to be safe for kids to play. 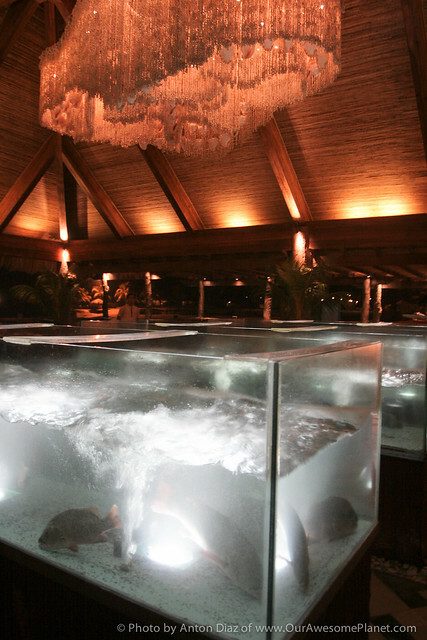 Designed by Benji Reyes, the rooms reflect his signature take on Modern Filipino architecture. 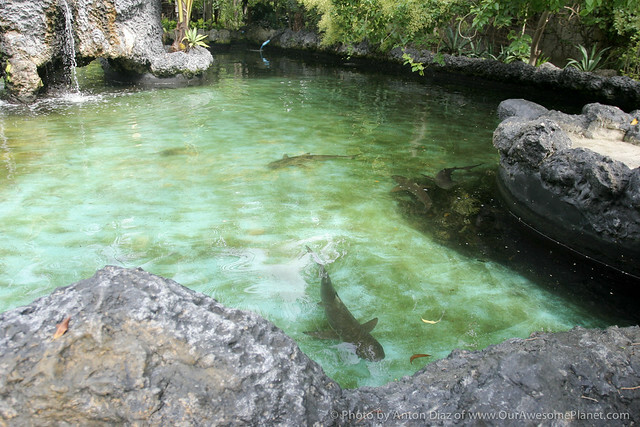 The resort takes care of a few baby sharks, which you can feed at 4pm everyday. 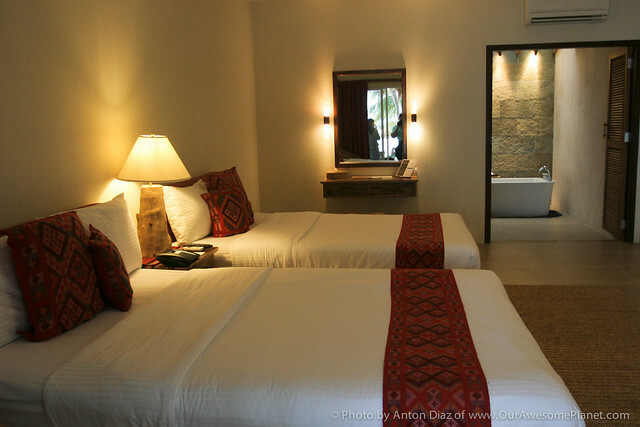 The Amuma (which means "Pamper" in Visayan) Signature Massage is best enjoyed in the comfort of your own room. 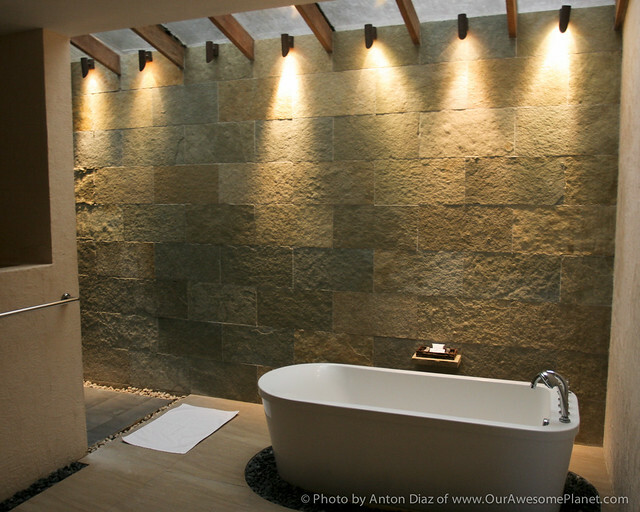 Go for the 60-minute Full Body massage or the Pik Pik Kawayan sa Siki (Foot Massage using Bamboo Poles). 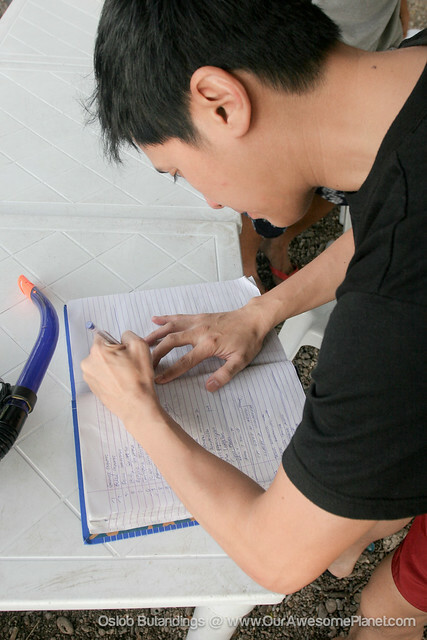 The massages range from P600 (for 30 minutes) to P2,000 (for 90 minutes). My site is worth$2,691Your website value?